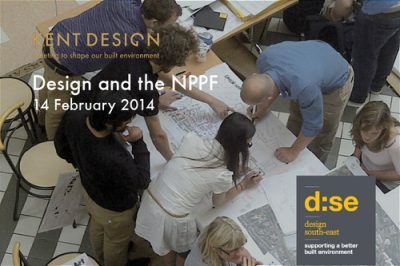 Design South East is pleased to announce the second in a series of topical Kent Design Training courses on 14 February 2014 – Design and the NPPF. The overall objective of this course is to raise the profile and understanding of the role of Design in the Planning system, especially National Policy. This includes the tools identified within the National Planning Policy Framework (NPPF) for helping attain good design. Case study: the Marlowe Theatre, Keith Williams (Keith Williams Architects) Including a tour of the theatre buildings. The course will be held at the Marlowe Theatre, Canterbury from 10:00am – 4pm on 14 February 2014. Lunch and refreshments will also be included for the day.